So after my two posts yesterday I was running around like a girl at the Barney’s Warehouse sale and completely forgot about Anna Wintour’s birthday. To those of you who know me personally, this is like me forgetting to accessorize in the morning or put on my red lipstick. I feel quite terrible, granted I only missed it by 12 hours, but I still feel badly. Maybe I will make my own next week and post it. 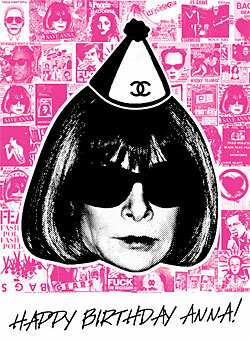 But for now, Happy Birthday Ms. Anna Wintour, and may there be many many more!